Some three dozen migrating Barn Swallows fly above the hotel garden where I am having coffee at the Breeze Bar by the pool. The lagoon has some sort of greenish-sandy colouration, then comes a dark belt of a coral reef, then turquoise shallows replaced by dark and deep waters of the bay. From the white-sprayed waves comes a moist and salty breeze. A Lesser Kestrel now flies above, IDd by its visibly dark wingtips. Soon there are half a dozen African Rock Martins which I cannot see that well because of those palm leaves above… Hey, am I complaining? I wouldn’t mind watching birds through palm leaves forever! Waves, deep blue sea and that salty scent. From my poolside viewpoint I can encompass four countries: Egypt where I am and, over the sea, Israel to the far left (there’s a birding mecca of Eilat), Jordan in the middle and finally the endless deserts of Saudi Arabia to the right. Oddly, not a single gull in sight. There’s a bird over water… no, it must have been some thought in my mind and what I saw was merely a shadow of that thought… but no, there is a bird! Focusing on it… another Barn Swallow. 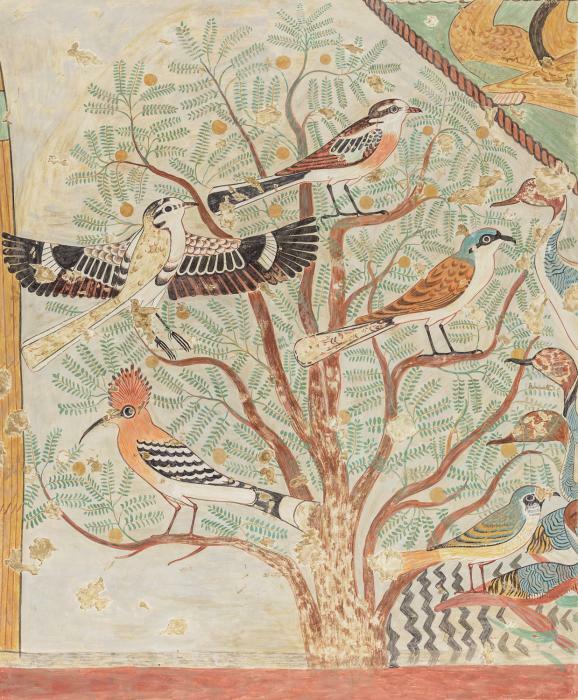 “Birds in an Acacia Tree” – scene copied from an Egyptian tomb dating to about 1850 BC. Clockwise starting from lower left: Eurasian Hoopoe, Great (or Lesser?) Grey Shrike, Masked Shrike, Red-backed Shrike and the Common Redstart. Whenever the breeze gets stronger, I feel sharp pecking of grains of sand against my face. The heat is on and unlike in the morning, the breeze coming from the sea is hot and dry, overwhelmed by Arabian deserts at the other side of the bay. The breeze will remain hot way into the night, well after midnight. Now I am having ice-cold Sakara, a quite recommendable local lager. White-spectacled (a.k.a. Yellow-vented) Bulbuls are watching me from those palm leaves. The hotel garden is fringed by acacias where an endemic species of the east Mediterranean, the Palestine Sunbird, can be found, here at the very south of its range. Then, putting his fingers above his head as a crest and drawing a long beak in the air, he asked me if I know of a bird called the Hudhud? The Hoopoe, I suggested, and showed him the painting in the bird guide. 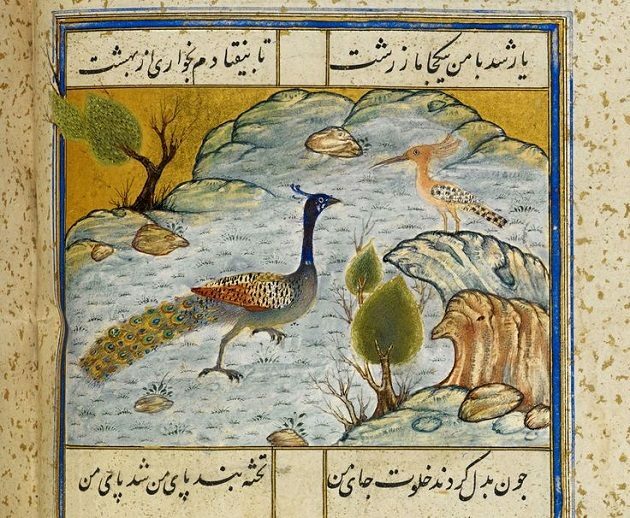 Yes, the Hoopoe, and do I know of King Suleiman? Thinking of the Turkish sultan Suleiman the Magnificent, I said “yes”. Then he started a story of the Suleiman and the Hoopoe and how the Hoopoe was late and had to justify his absence to the King. But he (the hoopoe) tarried not far: he (came up and) said: “I have compassed (territory) which thou hast not compassed, and I have come to thee from Saba with tidings true. The King Suleiman then gives a letter to the Hoopoe to take to the Queen Belkeis, asking her to submit. And the Hoopoe took the letter and… well, the bartender’s English was somewhat limited to go into finer details, so I learned only the basics from him. You can find the full story here, in the writings of Freya Stark. The darkness has already fallen when the kingfisher flew away. I almost packed binoculars into my rucksack when two egrets caught my eye while clumsily trying to land into a very top of a eucalyptus swaying in the wind. Focusing… Cattle Egrets! Ready to leave, I put my hat on… and spill all the sand collected in it onto my head. Only later that evening I realized that I actually heard a legend on how the Queen of Saba and the King Solomon met! PS. These events took place in September 2010, before the Arab Spring, so due to security reasons, someone might ask would I go to Egypt now? Yes, I sure would. Thanks for sharing these images. They are amazing! I saw a Hoopoe once and will never forget it. Wonderful post, it conjures up some beautiful and mystical imagery.